For players who want to enhance and broaden the utility of the crafting table, this mod adds a very simple item to Minecraft: the project bench. This is a single block that combines the crafting table and the chest. The project bench enables the player to place a recipe in the crafting area and make it again and again by accessing the chest portion of the bench. 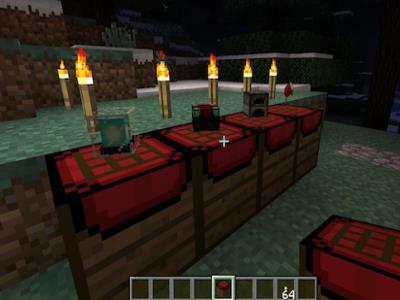 For players who want to enhance and broaden the utility of the crafting table, this mod adds a very simple item to Minecraft: the project bench. This is a single block that combines the crafting table and the chest. The project bench enables the player to place a recipe in the crafting area and make it again and again by accessing the chest portion of the bench. The chest portion gives the player eighteen spaces in addition to their personal inventory from which to work. Once installed, the Project Bench Mod for Minecraft requires a simple recipe for the player to get started. The player simply needs to place a chest in the bottom center block with planks on either side, and a crafting table in the middle row center block with iron ingots on either side. This results in the project bench. There are also recipes in this mod the player may use to upgrade the bench, if they choose. Materials placed in the chest part of the project bench stay until removed. This means players can return time and again to the bench to craft recipes with the materials they have placed in it. In addition, materials placed on the table top will remain, rather than being discarded when the player exits the project bench view. This is very handy if the player needs to return again to craft more of the same item. The project bench will also automatically use materials in the chest to craft more of an item, so the player does not need to place items on the table again and again. This handy little bench makes it even easier than before to craft items in Minecraft.